Caroline Larsen is a Brooklyn Based artist who graduated from Pratt Institute with an MFA in 2015. 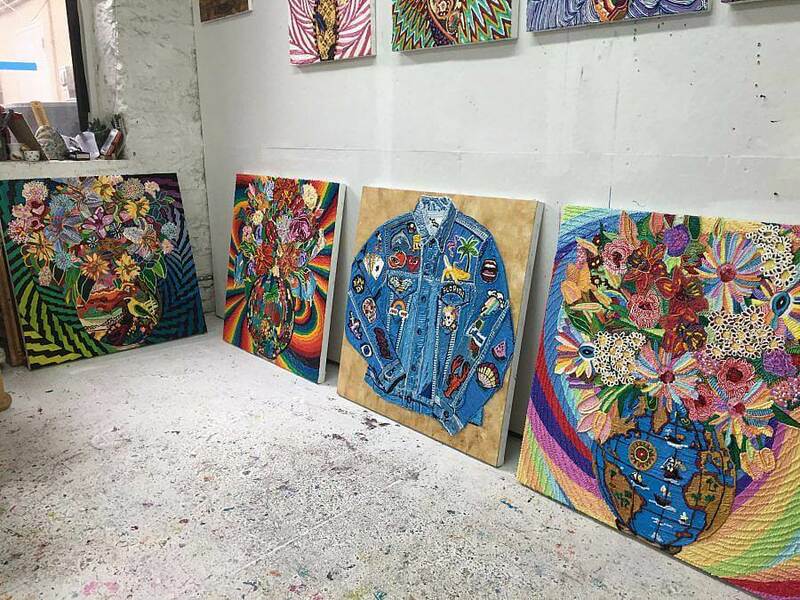 Recent and notable solo shows include 359 Canal Street, On Canal, special exhibition with The Hole NYC & Wallplay, Flower Frenzy at Andrew Rafacz, Romance on the Islands, Residency Show at Dio Horia, Mykonos, Greece, and Mountain Painting at General Hardware Contemporary. I am a painter and I live in Brooklyn! I absolutely love it! I love to walk everywhere and being able to go to all the museums and art exhibitions. I have a solo exhibition in January and I am full steam working on paintings for that! I am making these psychedelic still life paintings and a few other subject matters that I have been playing around with! The new paintings are intense, but I am very happy with them. I also have an ongoing seed bead embroidery project, seed beading is extremely time consuming, so I do it at night and when I am traveling, it makes the time pass and I really like the way it looks. I started seed beading this year when I made a beaded and sequined ash tray, its non functional, I was overwhelmed by how laborious of a process it is, but it really thought me the importance of slowing down and that not everything has to be immediately completed! I have three paintings included in The Beyond – Georgia O’Keeffe + Contemporary Art, its opening at the North Carolina Museum of Art on October 13th! I am very excited! What materials do you use in your work and what is your process like? 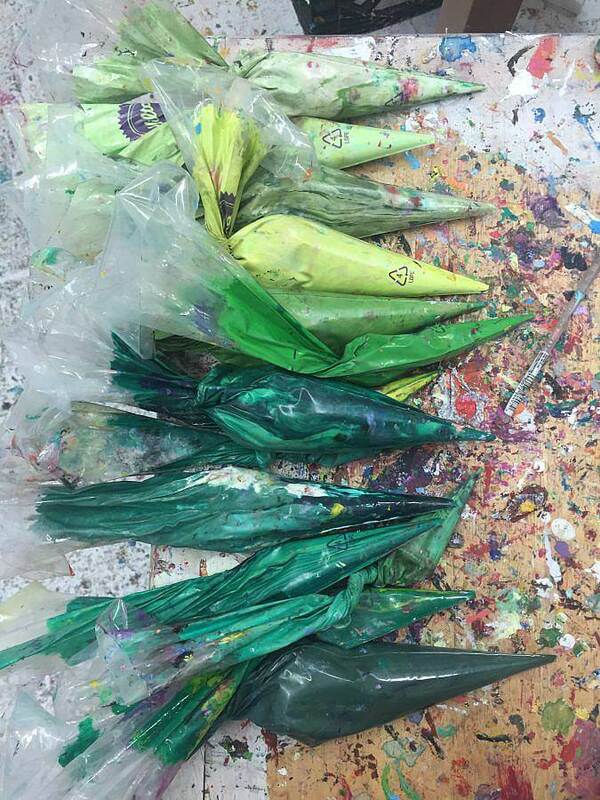 I use only oil paint. My process is after I come up with an idea for a painting I make it first in photoshop, for example with the psychedelic still life paintings I find the background first, then I will manipulate it in photoshop and start building the painting from there! Once it looks great in photoshop I draw it on to my canvas in my studio and start the painting! I usually do the background first because thats the easiest part of the painting and then I will move around the inside of the painting. When did you first begin to paint? I started painting when I was really little, my parents put me in art classes at a very young age. What was the last exhibition you saw that stuck out to you? Trudy Benson’s show at Lyles and King is amazing! Its up right now! 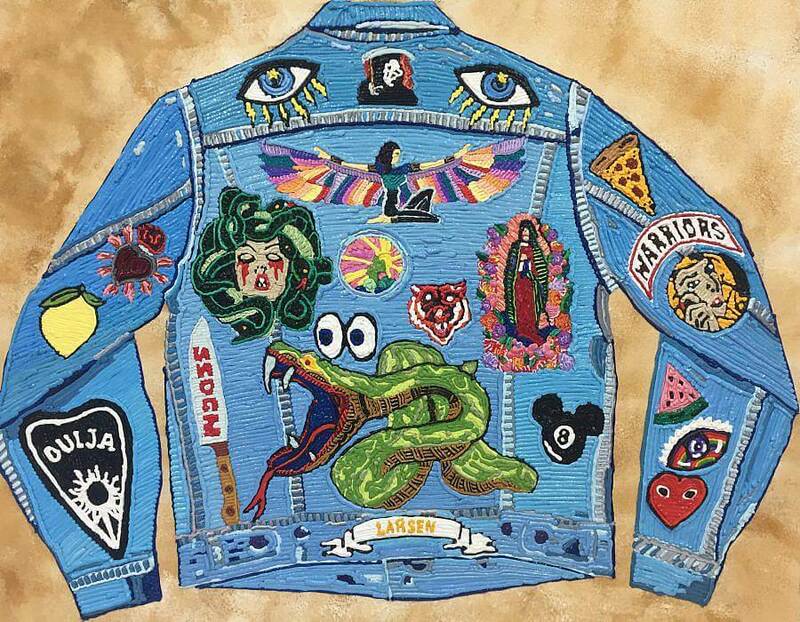 Clothing, patches for jean jackets. I have been collected patches for jeans. I also really like mugs, but I don’t really collect them because our apartment is so small! 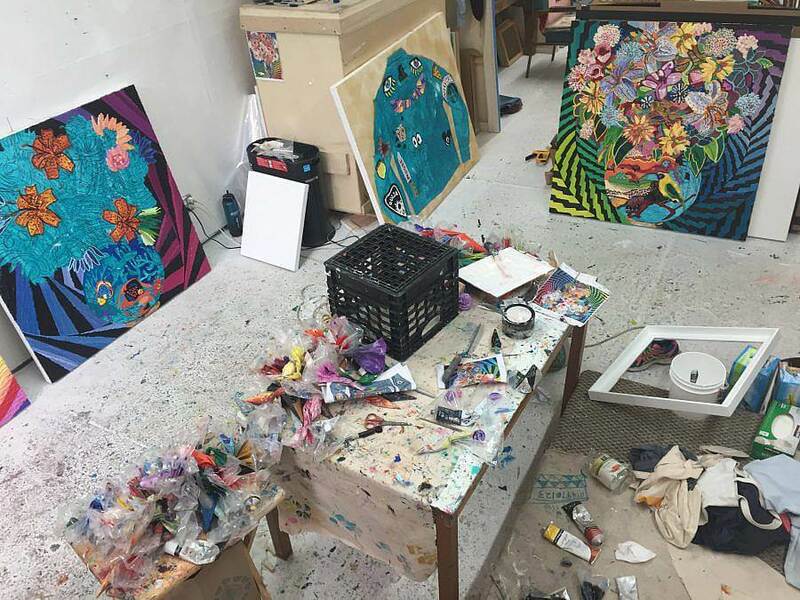 Describe your current studio or workspace. I have a studio! I love it! I have attached some pictures. What is one of the key elements you consider when installing your work? I try to give the work a lot of space, because they are so busy visually! Where do you see your practice going next? Any major changes happening in the studio? 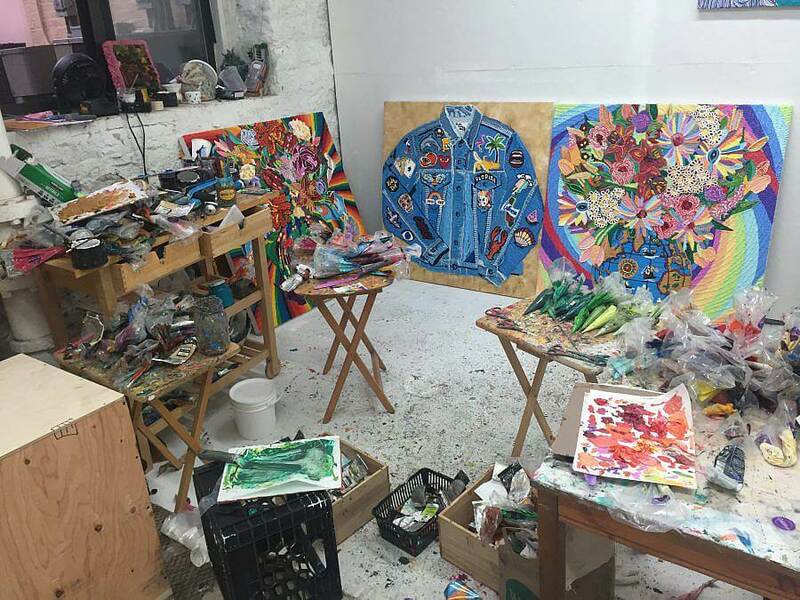 I am working on these jean jacket paintings in addition to the psychedelic still lifes, so they are very different to anything I have ever done before! My dad told me a few days ago to always look on the bright side because that’s where you want to be!